>> Is Wine Considered Spirit? Wine is not one of the most alcoholic beverages in the world, yet some curious are wondering whether or not the wine is a spirit. 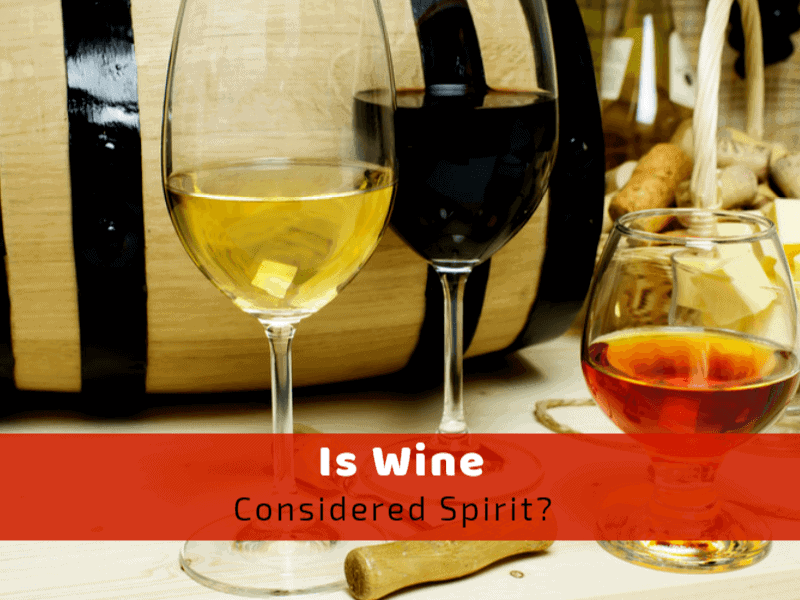 This question could rise rage among the wine lovers, but in the end, is wine considered spirit? And why would anyone ask this question, after all? I’m more than a wine lover. In fact, I venerate this drink. But admit I also had dozens of unanswered questions when I approached wine drinking for the first time. So, for those of you wondering if the wine is spirit and what is the difference between the two, this article is for you. Enjoy! Perhaps you’d like a quick answer to this question. So, no! Wine is not considered spirit. Even if some wines may have a higher alcoholic concentration, the production method makes the difference between the two types of drinks. If you’d like to learn more on this, keep reading to find out what is the difference between wine and spirits, and when should you serve one over the other. What is Wine and What is Spirit? Wine is an alcoholic beverage obtained through fermentation. Most wines are obtained from the fermentation of fruits, commonly grapes, but some wines can be made from the fermentation of flowers. A few examples are the dandelion and elderflower wines. Grapes aside, wines can be made from almost all fruits. You can have banana wine, strawberry wine, peach wine, and the list could go on and on. In some Oriental cultures, wine is even made from rice and other cereals, although the taste is quite different from what you could be used to. Regardless of the fruit or plant wine is made from, the process is the same. The fruits or flowers are first crushed to release their juices, which are then fermented with yeast. After fermentation, the wine is raked to remove the sediment, then either aged or bottled. Since the most famous wine is the grape wine, we commonly talk about red, white, rosé or sparkling wines referring to beverages obtained from different varieties of the same fruit. Moving along from wine to spirits, spirits are obtained through distillation. Some of them can be made of cereals, while other spirits can be made from wine. Perhaps this is where the confusion starts, as one of the most famous spirits, the brandy, is nothing but distilled wine. But besides brandy, spirits also include vodka, whiskey, and gin. What Is the Difference Between Wine and Spirits? Apart from the production process which is the main difference between the two, another difference lays in their alcoholic content. Wines are rarely more alcoholic than 24%, while spirits are rarely less alcoholic than this. In fact, almost all spirits have an alcoholic content of over 40%. When to Serve Wine and When to Serve Spirit? This question doesn’t have a universal answer. It is hard to tell when to serve one drink over the other, as it all comes down to preference. The world we live in has made us think wine is a table drink, used to accompany foods at dinner time. There are dozens of possible wine and food combinations. Spirit is universally seen as an appetizer or dessert drink. You won’t hear many people serving a spirit with the main dish. Serve a glass of fresh, neat cognac with a platter of raw seafood and shellfish. The best pairings include oysters and clams, scampi, and king prawn. Lobster claws also find a smooth, fruity companion in cognac. Who would have said bourbon pairs with pickled veggies? But you have to try to believe it. The tart crunch and sourness of the pickled vegetables bring subtle flavors which complement the characteristic tobacco flavors of bourbon. The saltiness in the veggies also helps reduce the burn sensation given by the bourbon. A glass of rye whiskey served on rocks can easily complement the saltiness of the seaweed, the heft of the rice, and the distinctive aromas of sushi raw fish. This tasty spirit complements best a fattier sushi containing salmon and tuna fish. Have you ever thought about pairing your dinner with a spirit? You haven’t? Well, try out this combination. Cook roast duck breast and surprise your guests with a glass of scotch instead of a red wine. The fat of the duck combines with the smoked aromas of the drink, and the strength of the spirit complements the taste of the dish. Another pairing you’d probably never thought of, but that’s guaranteed to melt your heart. The sweet yet complex flavors of the rum complement the equally sweet and complex flavors of glazed chicken in a unique combination you’ll hardly forget. Delicious and wild. Lamb and tequila complement themselves in terms of complexity. The fattiness of the meat goes wonderfully with the wilderness of a neat tequila. Pair your drink with lemon salt and lime to enhance the flavors of the dish even more. From all spirits, the one that pairs best with desserts is no doubt the brandy. The subtle chocolate hints in the drink go heavenly with the heavy chocolate flavor of the brownies. The caramelized notes and slightly fruity hints reminiscent from the wine also complement the hearty texture of the cake. Okay, I know Port is a wine, but some varieties of Port are so fortified they can easily pass as spirit. I’m talking of a very fortified Port which seems more brandy than wine. Pair it, or a great brandy as a matter of fact, with stinky cheese. Think Danish blue cheese, gorgonzola, and other similar varieties. The way this spirit pairs with it is a treat. By now, you should know that wine is not considered spirit. It must also be clear some spirits are produced from distilled wine. Think of brandy, bourbon, and vermouth. Some fortified wines can also be alcoholic enough to be served as spirits, although they are technically a wine. What is certain is that both types of drinks deserve the same attention. You can pair spirits with food just as you would pair wines. There are plenty of interesting food and wine combinations to try, and for a more comprehensive pairing, you could serve the same food with both wine and spirit and note the differences. You must also know there are some interesting cocktails that mix wine and spirits in the same glass and these are also noteworthy. But what about you? Would you rather enjoy a glass of your favorite vino or one of brandy or whiskey? What do you think about the pairing suggestions above? I’d love to hear your thoughts, so tell me what you think by leaving a comment below, or get in touch via the form on our contact page. Until then, don’t forget to enjoy your favorite wine or your favorite spirit!